In the past, the rose was considered a symbol of love and a single rose always meant only one thing - it meant the words "I love you." So it is appropriate that your first gift as husband and wife would be a single rose. In the beautiful Rose Ceremony, the Bride and Groom give each other a Rose. The Rose Ceremony is placed at the end of the wedding ceremony just after being pronounced husband and wife. In the old language of flowers, a single red rose always meant "I love you". 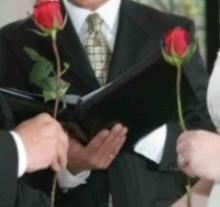 The rose ceremony gives recognition to the new and most honorable title of "Husband and Wife". The couple is also advised to use this symbolic rose in trying times when they cannot seem to find the right words to say, such as "I am sorry," or "I forgive you," or "I am hurting." The rose then says what matters most of all, "I still love you," and can overpower all other things and all other words.